Hello and welcome to the exciting website of saxophonist/composer Andrew Vogt. This is also the official home of Drew's Blues Records. Check out the hot new CD "Cats Afoot" we just released. Andrew performs regularly in Colorado with his own groups ZARO, The Twirling Zucchini's and The Andrew Vogt Gypsy Street Trio. He also performs with The Subterranean Jazz Quartet at Ace Gillett's, Pianist Mark Sloniker, The Jonny Mogambo Band, The Just Jazz Quintet, Jerry Weiss, and others. Andrew also freelances with many other musicians from a variety of musical backgrounds so you never know where you might run into him! If you are looking for the latest in exciting information about Andrew Vogt and his musical world then you've come to the right place. Here at Drew's Blues we encourage email and feedback on performances you might have seen. Also, feel free to join our email list to receive updates on upcoming shows and appearances. Of course, you can always click on the upcoming performance link to check the calendar. When he was a kindergartener, one of his favorite albums to select for family dinner music was the Breakfast at Tiffany's soundtrack, featuring music and composition by Henry Mancini. This music, particularly the saxophone parts, inspired him to want to make music a predominant part of his life. Now, Andrew Vogt is a professional freelance saxophonist performing gigs in Fort Collins every week as well as band director at three local schools. "I always loved music, since I was a little kid. My dad had a good record collection, which I still dig into. My two brothers and I took turns picking dinner music. One album Dad had was Henry Mancini's Breakfast at Tiffany's. It was my favorite. It had great saxophone, and I was hooked when I heard that," he said. "They played jazz and took us to opera. We were exposed to good music early on." 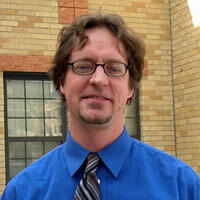 Vogt splits his time during the day as band director at Saint Joseph Catholic School in Fort Collins, Saint John the Evangelist Catholic School in Loveland, and Immanuel Lutheran School in Loveland. He appreciates the the opportunity to be involved in music education and introducing children to instruments. 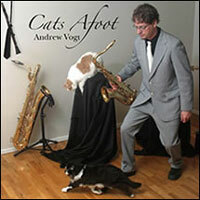 Jazz eclectic Andrew Vogt continues to draw on his many and diverse influences for his latest release, the cleverly-titled "Cats Afoot." Recruiting the finest players in the vicinity of Fort Collins, Colo., and deploying them in sextet, quartet and duo settings, the versatile reed player delivers a satisfying, smile-inducing recording of mostly original compositions. The opener is Jeff Lynne's "On the Run," an old ELO tune updated with an upbeat jazz shuffle featuring the twin tenors of Vogt and Rich Chiaraluce, a friend, mentor and frequent collaborator. This infectious tune will have you snapping your fingers in time to the bright and swinging rhythm. Guitarist Bill Kopper also contributes a lithe, imaginative solo. Subterranean Jazz at Ace Gillett's! Great jazz at Ace Gillett's! Andrew Vogt on saxes! ©2019 drewsblues.com. All Rights Reserved. Website design, development & hosting provided by: Brian J. Bliss Design, Ltd.